When the credits rolled on The Girl and the Robot, I was surprised. Both by how sudden it was and by the fact that this is actually an episodic game. Nowhere did the developer Flying Carpets Games suggest it would be split into acts, instead opting to save the reveal for the credits after its abrupt ending. Bold – but effective. What isn’t surprising is that it turned out to be a fine game. I looked at The Girl and the Robot before in 2013. Back then it was just an early alpha build that just got funded through Kickstarter. Its particular blend of character-swapping puzzle solving and combat was enjoyable in spite of a few rough edges. But that was almost three years ago. How does the final version stack up? Rather well, despite a couple annoyances. The Girl and the Robot follows the titular duo as they attempt to escape the castle they’re trapped in. The sorceress who rules said castle isn’t so keen on letting them leave, however, and mobilizes her army of robots to stop them. As this is merely the first act, the plot doesn’t develop too much further than that. Portraits hint at the history of the castle and its previous rulers, as well as the girl’s heritage, but as the game is free of dialog and cutscenes are few and far between, the majority of the story is left to interpretation. You move through the castle switching between the girl and the robot to solve rudimentary puzzles, like holding down pressure plates with one character so the other can pass through a door, or splitting up to help each other progress in their respective rooms. You know – the usual assortment of co-op puzzles. The girl performs the majority of the problem solving, as she doesn’t have any weapons with which to defend herself. Whenever she encounters adversaries, her only option is to outrun them. The robot, on the other hand, is almost entirely built around combat. 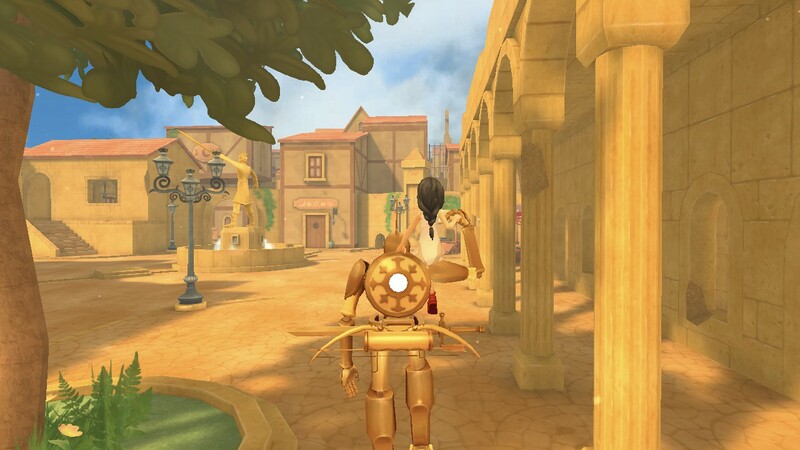 Equipped with a sword and bow, it’s able to dispatch enemy robots with ease. Combat is a simple affair. Enemies charge forward as soon as they see you. Their movements are predictable and easily countered, however, making them little more than a minor roadblock. A quick sword combo usually takes them out. More heavily armored guards slightly complicate things with how fast they raise their shields, but don’t pose that much more of a threat otherwise. The robot’s movements feel a bit stiff, though that seems intentional. It doesn’t affect combat or exploration much, except when the game attempts to throw multiple foes at you. The game doesn’t lend itself well to fighting multiple combatants, yet it loves to plunge you into those situations anyway, especially toward the end. Worse, it also throws foes who run right up to you and explode, leaving your character wide open for attack while also dealing significant damage. Getting stun-locked until you eventually die and revert to the last checkpoint happens a lot in these cases. My patience began to wane quickly every time I got a game over due to those circumstances. It’s especially frustrating given the game shows it’s capable of interesting scenarios during the first boss battle. Here, you’re swapping between the girl and the robot to take on two separate foes. The girl fights the sorceress by placing her in the line of fire of a cannon, while the robot fights off a fellow automaton. It’s a shame the game doesn’t have more cases like this to keep the combat fresh. The Girl and the Robot is at its best during its quieter moments, when the focus isn’t on combat or problem solving but exploration. The brief foray into the town stands out as one of the more memorable sections. Though the streets were empty and the space small, it was a lovely, modest settlement. Wandering through the streets as the robot, the girl seated on its shoulder, just enjoying a nice walk through town, taking in the sights, served as a pleasant break from the action. The way the level geometry always wraps back around there was a nice touch as well. As this is only the first act, I’m hopeful the subsequent chapters will further refine the basis they have. The Girl and the Robot may hit a few snags here and there, but I did have a good time overall. Curious to see how the story develops.